Although I already covered some of this last Thursday (Stop digging, don’t you see how deep you already are? ), another incident has come to light that makes it even more clear that there are sadly a lot of people committing one of the most classic blunders—no, not that one about going up against a Sicilian when death is on the line—no, this one is from the Nixon era: it isn’t the crime that brings you down, it’s the cover-up. I’m speaking metaphorically, though. I am not trying to imply that anyone has committed a crime, nor that they are trying to hide it. In the case of the Silverberg incident, while there was plenty that is of the gatekeeper-y style of racism/sexism (not to mention the bigoted trope of calling any marginalized person who is being anything other than deferential “angry”) in the original offense, the real problem came when he wrote about how he isn’t racist or sexist—using racist and misogynist arguments to do so. So, the original comments could have been apologized for as thoughtless or ill-considered (and hypocritical), the denial just made the unexamined misogyny and racist presumptions undeniable. Turns out two weekends ago at LosCon Greg Benford got himself in a similar problem. Mike Glyer at File770 has several posts with statements from several people and there’s a lot to unravel, but the upshot was that Benford made a number of dismissive comments about works written by one black woman in particular and younger-than-him women writing sf/f in general during a panel, and then during the question-and-answer portion of the panel a pro sitting in the audience tried to call him on it and there was much yelling and recrimination. A lot of people are trying to defend Benford by saying that everyone else is being bigoted against southern people by taking offense. They are making the claim that “honey” is used as a polite term to address a stranger in many social circumstances in the south. And they are right to an extent, however, it is not always polite, nor is it an entirely ungendered term, as Benford’s defenders are trying to claim. Straight men in the south never use “honey” to address another man, it is always gendered. Queer men can use it either way, though straight men are quite likely to take offense if a man refers to them as honey. Women can use the term to people of any gender and often it is considered a polite form of address, but it depends on the context. An older woman might indeed address a younger person as “honey” if they are either asking them to do something, or suggesting that the way the younger person is behaving might be inappropriate for the situation, and so forth. The younger southern person would not take offense, and neither would anyone listening. Southern culture does have a very strong strain of respecting one’s elders, for one thing; the term “honey” in this case signals a difference in social standing. But if the significantly younger person were to call the older woman “honey” in the answer, she would be affronted, and other people overhearing would all agree that the younger person was being rude. Because this is inverting the social standing: the younger person’s use of the term “honey” in such a case signals that the older person doesn’t deserve the respect ordinarily accorded to elders. If a man uses the term to address a woman who is not a close family member or intimate partner, it also signals a difference in social standing. But depending on the context, the difference being asserted might be simply that the man believes that all women naturally must defer to him. While it might sound friendly, it’s definitely got a message of “respect your betters (and that would be me)” about it. 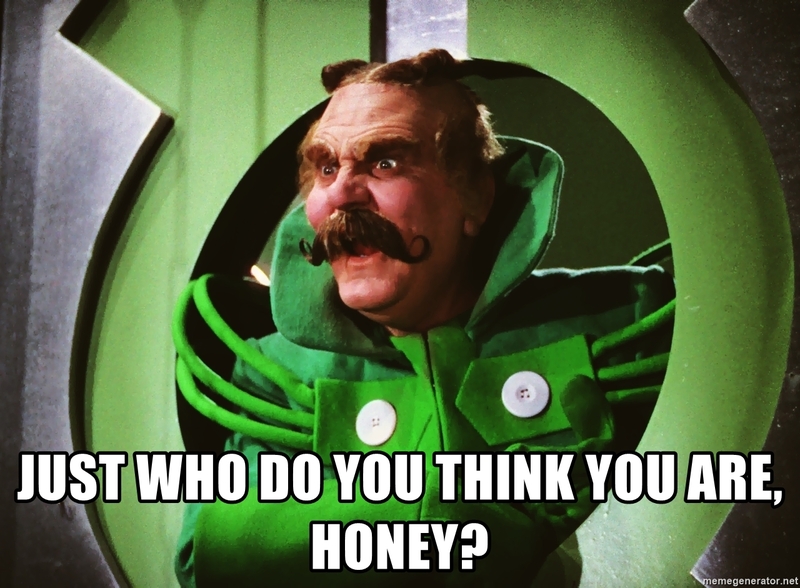 As another old white bearded guy from the south, I have also used the term “honey” when addressing someone who wasn’t my husband. And as a queer man, I have used it without regard to gender. But I also have had friends explain to me that it just amps up the condescension when I do that. I didn’t consciously intend it, but once it was pointed out, I realized I have to learn to stop saying it, because they are right. Not just that it sounds condescending (which it does). And also not just that it can hurt someone to be talked down to that way whether I intend it or not (which it does). But also because now I know both of those things. 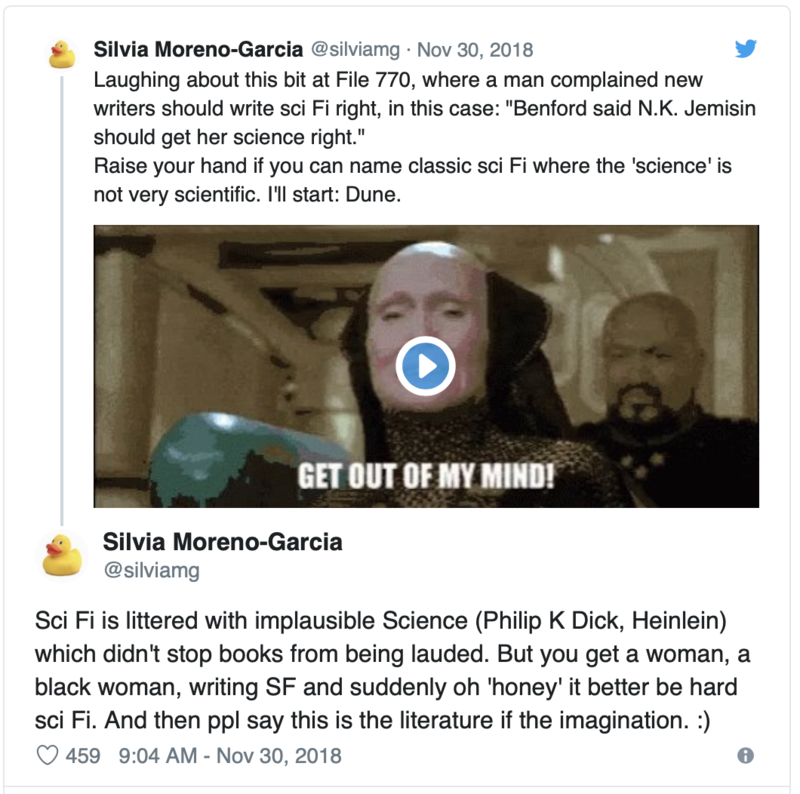 Another of my favorite authors, Silvia Moreno-Garcia, started a thread (which others contributed to) that gives more examples of science fiction written by white guys where the science is very, very wrong, but no one of Benford’s camp would ever say wasn’t sf. Another Benford comment that was directed at a specific author is even worse: asserting that a trilogy which recently won three Hugos in a row isn’t all that because “psychic powers to control the earth and earthquakes had already been done in the fifties.” Which is another favorite gatekeeper trick to exclude people. Never mind that every one of Benford’s own books could be boiled down to a single “idea” that someone had written many years before he started being published. But that’s the nature of gatekeeping: rules are stated in a way that sound like an objective criteria, but aren’t applied to works by white straight cisgendered men. But at this point I’m still just describing Benford’s original offense, and not how he dug himself even deeper into the hole. I’m not going to link to it because it’s hosted on sites that I refuse to give any support of. But his response boiled down to accusing everyone else of being too sensitive and lamenting the so-called victim culture. Ah, yes, that tired old chestnut! Every classic blunder deserves a classic racist/misogynist/homophobic dog whistle, I guess. But just to be clear: if you claim that other people are being too sensitive, all that really means is that you’re offended because you think you should be able to disrespect whoever you want and never face any consequences for it. You are at a playground. A gaggle of four year olds is running about. One of them is not paying attention and accidentally sends another plummeting off the equipment and into the asphalt. Suddenly, there is screaming and crying. Mothers race to the scene. I mentioned above the time when a friend called me out for using the term “honey” in a condescending way. I wasn’t intending to belittle the person I was talking to, but intention isn’t an exculpatory factor. My friend was hurt by my words, and that is on me. More importantly, once I have had this explained to me, the onus also is upon me to avoid such thoughtless words again. It is tough breaking old habits, I know. I have screwed up since that was pointed out to me, but the answer isn’t to blame my friend for being overly sensitive. The onus is on me to keep trying to do better, and apologize sincerely when I mess up. 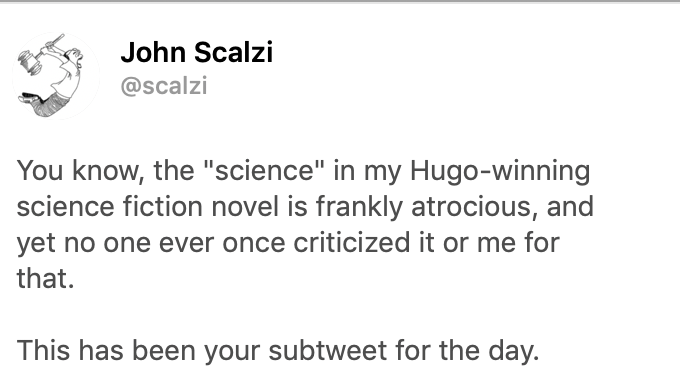 It’s also galling when a professional writer, of all people, tries to claim that words don’t matter. They do. We should take pride in taking responsibility for what we say and write.